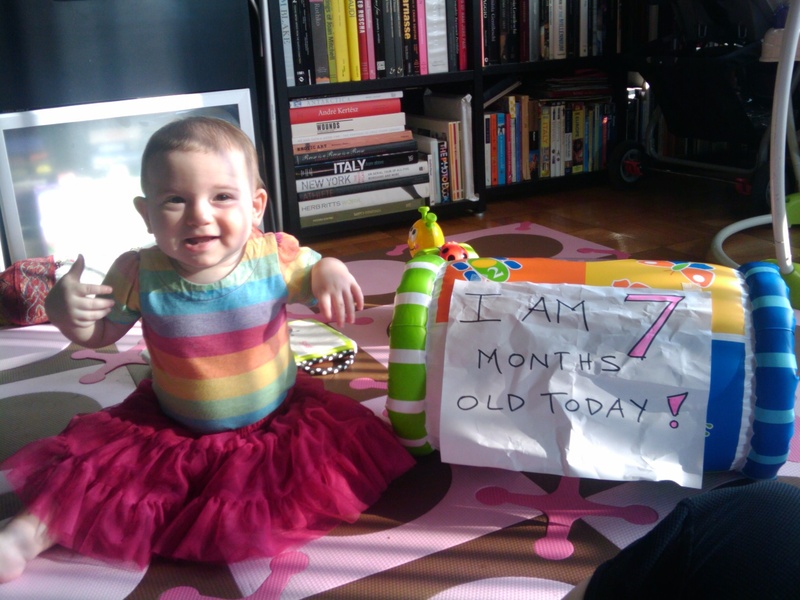 Seven months ago I pushed an amazing baby girl into this world, in the middle of a snowstorm, on a Thursday morning. Two teeth, crawling legs, 18 pounds and sloppy mango-zucchini dinners later, I am in endless love with my daughter. To say that this love was unknowable before it existed is an understatement. For all the hyperbole of mothers declaring that they would allow themselves to get hit by cars for their children, I know it to be true. Even the worst of days can be turned around by one smile or giggle from my little babe. This is a truly remarkable improvement over a glass of wine at the end of the day to take the edge off. Baby smiles are the new Xanax. Tonight I’m going to a BBQ and decided to bake David Lebovitz’ Chocolate Financiers as my contribution to the evening. These delicious little treats were one of the first Gluten Free baked goods I ever made from scratch. After tasting how amazingly chocolatey and moist these were, I haven’t used a prepackaged mix for Gluten Free baking since. Even before I was diagnosed with Celiac Disease and went Gluten Free, I never used Duncan Hines or Betty Crocker. I’ll cop to relying on Aunt Jemima for pancakes, but we usually make those in the morning, so we deserve a break on that one, right? I discovered this recipe by Googling “almond flour + chocolate”. I clicked a link to (then unknown to me) smittenkitchen.com and was amazed. Smitten Kitchen not only told me that this recipe appears in (also then unknown to me) Shauna James Ahern’s life-changing book Gluten Free Girl, but that the original recipe came from the perpetually amusing and talented (yep, also then unknown to me) David Lebovitz. How I managed to be Gluten Free that long and not know about Shauna Ahern’s inspiring website glutenfreegirl.com or her book, was astonishing. Who knew that Googling “almond flour + chocolate” would open up a whole new world? The first time I made the financiers, I was so excited to have found the recipe, I used the only possible pan I already had: an oversized muffin top pan. They came out looking like amazing brown saucers from outer space, but more delicious than any other Gluten Free thing I had ever baked. If I remember properly, I don’t think I had any almond extract and so I used vanilla instead. It worked, but they are so much more delicious with the almond extract. Of course, immediately after that first foray, I went to Sur La Table and bought pretty little molds to make them properly. The next time I baked them was for Thanksgiving and I added halved fresh cranberries. The tartness of the cranberries went perfectly with the chocolate. I wish I had pictures of those little cakes with burst cranberries on top–they were so festive. Now, I use this recipe whenever I want to bake something I know I can count on–like today. Preheat the oven to 400 degrees F. Grease financier molds or mini-muffin tins. If you also have some brown or white rice flour, lightly sprinkle some over the tins. Melt the 6 Tablespoons of butter and then let it return to room temperature. You can do this in the microwave or in a small sauce pan. If you have the time, use the sauce pan and stove, it melts better. In a large bowl, mix the dry ingredients (almond flour, cocoa powder, salt, powdered sugar) together with a whisk. Add the egg whites and almond extract. At this point, I like to use my electric hand mixer to get everything well mixed. Next, gradually pour in the melted butter until the batter is smooth and the butter is no longer visible as its own ingredient. If using a hand mixer, keep the speed at its lowest and be careful not to over mix the batter. Spoon the batter into the mini-muffin or financier tins, filling each receptacle only about 3/4 full. Bake the financier for about 10 minutes and then check for doneness. They should have risen slightly in the tins and feel springy to the touch. The insides stay quite moist, so if you cannot resist checking with a toothpick (I can’t help it! ), do not overcook. After removing the financiers from the oven, let them cool completely before removing from the tins. Notes: When I make these in individual molds, I like to keep them stored that way. If you reheat them in the oven for a few minutes, while still in the molds, the tops crisp up again, like they were just baked. Though these need no decoration or addition, to jazz them up, you can add bits of chopped berries to each financier right before placing in the oven. Half of a cranberry on top of each also works well. After a Greek omelet with two friends in town unexpectedly from Philadelphia (who wanted to go to the Met), I found myself at an entrance to Central Park East, gifted with the first perfect day of Spring. New York Times under my arm, I weaved my way through the dog and baby show (which included dogs in strollers and babys on leashes!) and settled on a half shady spot, under a big tree by the boat pond. I was halfway through reading the T Magazine when a horde of people scurried to a tree across the lawn from me. Binoculars and telephoto lenses were trained on a mass of branches at something so small I couldn’t see it from afar. Scrambling, so as not to miss the excitement, I approached one of the apparent bird watchers and learned that a yellow throated warbler had been flying around Central Park, about 140 miles away from where he is supposed to be. (It was confirmed to be a male warbler). I was lucky enough that the tiny guy flitted to a low branch and I got a peek at his bright yellow throat before he flew away. As I began walking downtown through the park, I spotted a woman with her big brown bunny on a leash. That’s something I would expect to see in Tompkins Square Park–not on the Upper East Side! Ouch! The top of the Chrysler Building is very sharp. I know this is the East River, YOU know this is the East River, the question is, does this uber-tan, uber-blonde, speedo wearing, male model wannabe know he's posing on a slab of discarded concrete on the East River? The 23rd street portion of the river walk was impressively well-kept and it felt great to be out with so many other New Yorkers walking, biking and blading. After almost 6.5 miles of walking, the sight of the Williamsburg Bridge above was very welcoming. Walking over the pedestrian bridge at Delancey Street I was relieved to be minutes from popping my shoes off, a cold drink and the loo, but this extraordinary hike made me more in love with New York City than I had been in a good long time. Living on the Lower East Side is great, but this journey made me re-appreciate “uptown,” too. I’d been previously re-inspired about living in New York, after reading this week’s cover story from New York Magazine. If after reading it you’re not newly invigorated about the big apple and determined to make more of your own discoveries, I’d be surprised. Anyone know a good foot masseuse around here? Look out Gluten Free bakers! The long agonizing wait is almost over. The Baby Cakes NYC cookbook is coming! You can pre-order it on Amazon.com now or it will be in stores the 1st week of May. Those clever gluten free gals produced a book launch video as delicious as one of their frosted cupcakes. Watch it, pre-order, and then head to 248 Broome Street (Btwn Orchard & Ludlow) and get a slice of their Gluten Free Banana Chocolate Chip Bread. Mmmmmm. I wish I could have my copy now….if you can get me one before May I’ll bake you something with frosting. And that’s a promise! Until then, there’s no way I’ll be able to walk home from the F train Delancey stop without swinging by for a treat. What I want to know is, who are the Costomey, and why are the restrooms only for them? Walking home from SoHo on Grand Street, I found a lot of interesting things for sale in the windows as I was passing through Little Italy. Baby Jesus and Firearms. Get a cannoli to go from Ferrara and you’ve got one hell of a night. Originating at the East River, adventuring through the Lower East Side, China Town and SoHo, Grand Street comes to a halt at Varick Street, as if to say, “This is as close as I get to Jersey”. Exit the B/D line at Grand Street and you can find crabs so fresh they’re still clawing at each other in their shallow plastic tubs. Bok Choy greener than will ever appear on your plate at Congee Village. And all the amazing finds of cavernous “99¢” stores: a bamboo steamer for $2.99, wrapping paper, rubber hotwing key chains, flip flops and mops. Heading East, Chinese bakeries with custards and pork buns give way to fabric emporiums, banks, pizzerias and shells of businesses rattling with ghosts of garments and sales girls. Kosher diners, bialys, drug stores, a few modern bistros, a supermarket (Kosher and not) mix with bodegas, cleaners, a bike shop and an opportunistically named realtor: LOHO Realty. The last stop on the M14A bus is Grand Street and the FDR. That’s my stop, too. I hear the whispers of the Lower East Side, catch the neighbors buying a slice of babka to eat on the way home from the bakery and watch with mixed emotions as new bars and restaurants pop up around me where our grandparents hawked fruits, keys and religious articles. I’ll be sharing the sights and sounds, the news and notions, the excellent and everyday of my our neighborhood, right here. Questions? Comments? Something you’d like me to check out? Drop me a line at contact[at]isntitgrand[dot][com] I’d love to hear from you.